Part of the adventure is that we aren’t actually living in the house (which is why were were able to tear out ceilings and rewire everything and sand every single damn piece of woodwork)–and this is a good thing–but it’s made the living quarters a little cramped. Right now, in the living room of our interim apartment, we’ve got my bed frame and mattresses smooshed behind the bookshelves, our new couch in front, and the dining room table in front of that. There’s also a bunch of boxes and bikes and chairs and heaven knows what else. Oh, and the cat, because she’s like that. 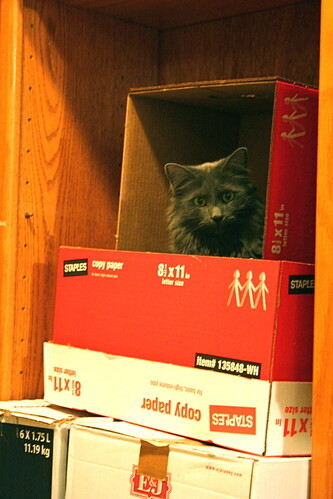 I mean, who wouldn’t like all the nooks and cranies and boxes to crawl into? She’s definitely well pleased in that perch up there behind all the furniture. But thinking about cats and their bookshelf climbing awesomeness reminds me of Renae of the awesome blog i eat food. I love Renae’s blog–fantastic recipes, super great kitty photos, witty writing–and I always love an excuse to make her recipes. When she posted her Sauerkraut Noodles for German-American day, I knew I had to make them. I mean, I’m a sucker for German food and a vegan German recipe is right up my alley. And it was really really good. 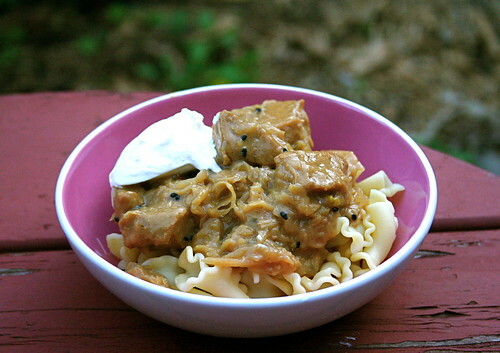 I made a few changes–didn’t use gluten-free noodles & used the sour cream as a condiment, not in the actual recipe–and I thought the dish was way rockin’ (and maybe a little too meaty–apparently the pre-made seitan I got for $1 at Kroger is pretty good, who knew). The sauerkraut and seitan pair perfectly and the noodles I used–campanelle–were wide enough to mock egg noodles, the marinade spot-on for an awesome German dish. And definitely a great meal for the colder weather that’s on the way! In a medium mixing bowl, whisk together the broth, mustard, apple cider vinegar, tamari, liquid smoke, caraway seeds, chili pepper flakes, and celery seed. Add the seitan and mix to thoroughly coat. Set aside for at least 30 minutes. Strain the liquid away from the seitan into a separate small bowl. Whisk in the arrow root powder into the broth mixture. Add the broth, seitan, and sauerkraut to the onions. Bring to a boil, then lower to a simmer. Cook for 10-15 minutes, until the sauce begins to thicken. Serve over cooked noodles and garnish with vegan sour cream. Wow, that looks even better than mine – glad it turned out well! And Dorian is super cute in her kitty fort! Holy Yum! Now I know what I’m going to do with the leftover seitan and sauerkraut in my fridge. Thanks!!! wow! This looks awesome. Sauerkraut is awesome on (or in) anything! aww, kitteh! those are tight quarters, Jes. wowzers! you are too awesome to be fixing up the home how you’d like to though – i can’t say i’d be up for all that renovation. i’m gonna make this dish happen with brown rice pasta and soy curls ’cause sauerkraut is a favorite of mine and it looks damn delicious! I don’t think I have ever tried sauerkraut but I do love cabbage! I must try this recipe one day as it sounds awesome. Oh, that does look like a great idea! German food in general sounds like exactly what fall wants. I keep meaning to make homemade sauerkraut one of these days, too…maybe I should actually fulfill that impetus.